Many commercial biscuits are laden with sugar and other unhealthy stuff which are really not good for baby and even older children’s teeth. 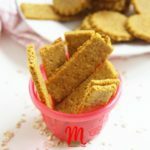 Sometimes you may want something healthy and chewy to keep the little one busy and this homemade biscuit is a perfect and healthy one to make. The ingredients used to make these biscuits are basically overripe plantain, oats and carrot…so it’s healthy all the way with carbohydrate, fibre and vitamins. These are also perfect for teething babies, so they can scratch their gums with ease. These plantain biscuits are egg-free, gluten-free, dairy-free and also sugar-free, with the plantain giving it a subtle sweetness…babies do not need to develop sweet tooth at this stage anyway. Blend plantain and carrot in a blender. You may add a teaspoon or two of water to the blender to help puree it well. Pour into a bowl, mix in the oil and spices, then start adding the ground oats little by little. Keep mixing till you get a smooth dough that is not sticky. Place the dough on a flat surface and roll flat. Cut into rectangle or round shapes, use a toothpick to design the top if you like and then put them in the oven. Bake for about 10-12 minutes, then turn the other side to bake too. Remove and allow to cool before giving baby to snack. *These biscuits are also good for toddlers and everyone in the family. *You can use carrot puree incase you have leftover from baby’s meal, then mash overripe plantain and add to it. Love this? Share with your friends and don’t forget to go like our Fan page on Facebook and also follow us on Instagram. Subscribe to Mummy’s Yum below…it’s free. A healthier option for keeping the little one busy. This homemade biscuit is also suitable as a teething biscuit. You can also use carrot puree incase you have some leftover from baby’s meal. Just mash the overripe plantain and add to it.